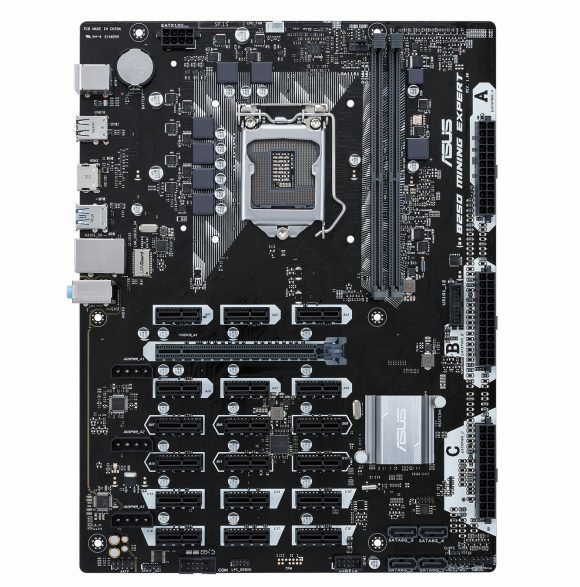 It seems that Asus is upping their mining motherboard game with a successor of their Asus B250 Mining Expert Motherboard with 19 PCI-E Slots. 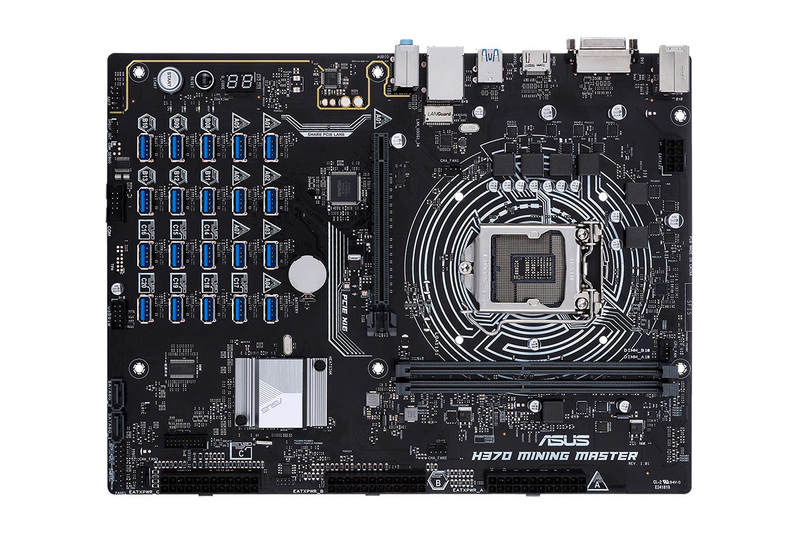 The new mining motherboard is called Asus H370 Mining Master and comes with support for up to 20 GPUs using direct PCIe over USB connections. The presence of USB connectors directly fitted on the motherboard simplifies connectivity by letting USB riser cables plug directly into the PCB and this direct connection is sturdier than using a PCIe card, with less chance of inadvertent disconnects, and it also reduces the total number of parts in your rig. You may notice that aside the 20 USB 3.0 connectors on the motherboard there is also a single PCI-E x16 slot, however this does not mean you are able to have a 21st GPU. The PCI-E x16 slot and the first USB 3.0 connector are labeled A01 and that share the same PCI-E lane, so you can have only one of them working with a GPU, not both at the same time. The Asus H370 Mining Master motherboard includes a suite of diagnostic features designed to make your farm easier to diagnose and manage in case of problems. A very useful one is the GPU State Detection (available in the Asus B250 Mining Expert as well), which scans the system at boot and indicates whether each riser port is empty, connected to a functional graphics card, or experiencing problems. The updated State Detection GUI clearly identifies the location and status of each port along with the alphanumeric code that identifies it. To further streamline troubleshooting, the board will ship with matching alphanumeric labels to stick onto corresponding riser cards. You’ll be able to quickly look at the labels to find flagged GPUs instead of being forced to trace the path of cables connected to affected ports. Efficient mining also requires a few UEFI tweaks that are consolidated in a special Mining Mode on the motherboard. The PCIe lanes are set to run at Gen 1 speeds to improve compatibility and stability with USB riser cards, the Above 4G Decoding is enabled, which is critical for supporting lots of graphics cards, and Launch CSM is disabled, which lets the motherboard and graphics UEFIs synchronize with each other. Mining Mode is activated by default, so you’re ready to go right out of the box, without having to mess around in the firmware interface… after all this is a dedicated mining motherboard and it should be ready out of the box. Just like the predecessor B250 Mining Expert the new H370 Mining Master comes with a trio of 24-pin primary power supply connectors, so you can connect to up to three PSUs simultaneously. Each one is tied to a separate bank of riser ports, allowing you to scale up the number of GPUs gradually and add more power as needed. Some motherboards require modifications and special startup sequences to run on multiple PSUs, but the Master is tailored for the task. All that’s required is for the PCIe power connector on each graphics cards to be plugged into the same power supply as the corresponding riser port. There is no information yet about pricing and availability of the motherboard, just that Asus plans to have it be available later this year. 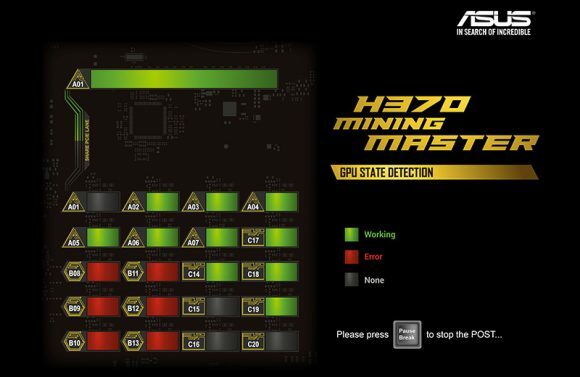 However Asus H370 Mining Master will be demonstrated running at full capacity in a custom mining rig being unveiled at Computex 2018 in Taipei, Taiwan from June 5-9. For now Asus is just teasing us with this motherboard and there are no full details about it, including info on pricing and availability. Still it shows that the company has interest in the mining market, especially after also releasing mining oriented GPUs. Unlike some other manufacturers however Asus is showing that they are designing their mining products with miners in mind and not just pushing something that is not worth buying like some others. 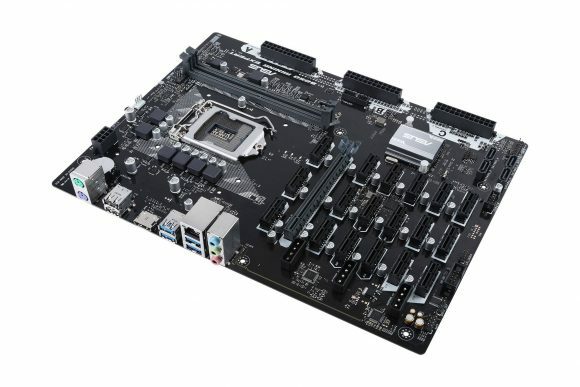 Their Asus B250 Mining Expert mining motherboard comes with three 24-pin ATX power connectors for directly connecting up to three power supplies without the need to use external means to synchronize the PSUs. There are also three 4-pin Molex power connectors on board for powering GPUs, though you probably will use powered risers and won’t be needing these. We are yet to see more information emerging, but things are definitely looking interesting already. 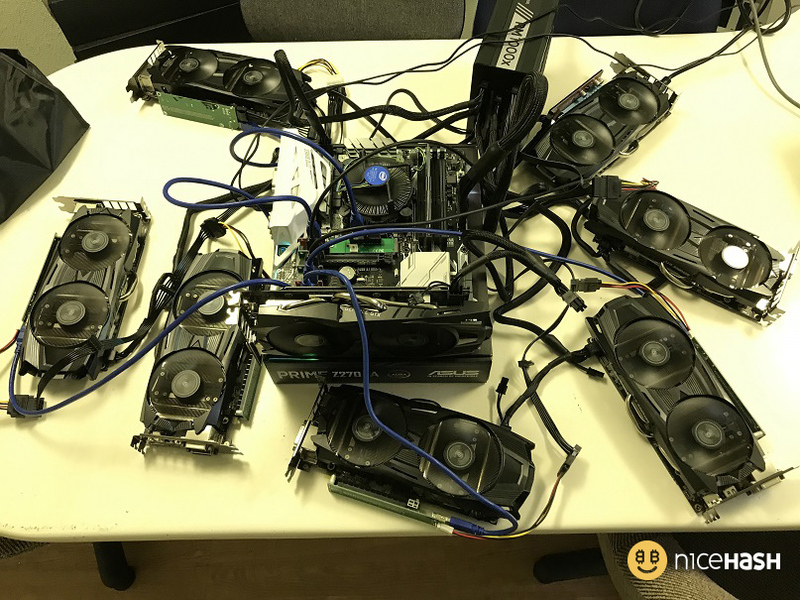 What you need to be prepared with motherboards for mining supporting so many GPUs is that there will be some unexpected challenges when building the mining rig. Cable lengths, connector spacing, enough space for proper cooling and so on. Design challenges emerge and the more video cards you use, the harder it gets to make things work as expected. Though once you clear the design for let us say 16 GPUs, then the next mining rig should be much easier and problem free to assemble… hopefully. NiceHash have published some interesting experiments they have done recently, building an 8x GPU mining rig using the Asus PRIME Z270-A motherboard. This motherboard has 7 PCI-E slots as well as two M.2 SSD slots and they have utilized the 7 available PCI-E slots and one of the M.2 slots with an adapter to get 8 video cards working. Their experiment was with 8x Nvidia GeForce GTX 1060 on that particular motherboard from Asus, though other cards will most likely work as well just fine. With the recent price spike and unavailability of cheaper 6x GPU motherboards for mining people are already looking into more expensive alternatives that work well for six or even more GPUs like this model from Asus for example. It is interesting to note that one of the M.2 slots was turned into the PCI-E slot by using cheap M.2 to the PCI-Express adapter that can be purchased from Chinese sellers on Ebay pretty cheap. You should however be careful if/when using such adapters as sometimes on some motherboards the M.2 slots are shared with some of the PCI-E slots on the motherboard. The Asus PRIME Z270-A motherboard apparently can be upgraded to 8 GPUs using this method, or you can just use the 7 available PCI-Express slots for a seven GPU mining rig instead of the more traditional 6x GPU configuration. The only drawback, the Asus PRIME Z270-A are not the cheapest out there as they use the Z270 chipset and you additionally increase the cost for the M.2 to PCI-E adapter, but then again you also get to connect up to 8 GPUs to a single mining rig (if your PSU(s) can handle that).